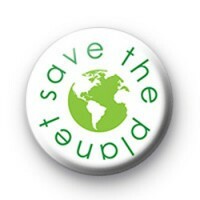 Save the planet white badge with a green planet earth globe and the text save the planet written around it in green text. These badges are popular with environmentalists and recycling groups and are used by students & teachers in schools to promote care of the environment and recycling. These 25mm badges are made by hand in the UK and we deliver worldwide. We have a large range of environment and green badges available along with recycling badges.